Mark Peredo knew he had to do something drastic. He had just returned from a journey that many people consider the trip of a lifetime—a journey that often restores a sense of peace, healing and spirituality to a person’s heart and soul. Yet after his 27-day, 600-mile walking pilgrimage across the Camino in France and Spain in late 2016, all that Peredo felt was a lingering combination of anger and brokenness. He was still trying to come to terms with the recent death of his father, who had always been his best friend. And he was still trying to completely recover emotionally and physically from the horrific accident in 2015 that nearly killed him when another driver struck his car head-on at a high speed—a crash that led Peredo to have eight surgeries and devastated the dreams that had just come true in his life. That’s when Peredo decided to do something drastic. He started a search for the driver of the other car, Luke Hutchins. During his search for Hutchins, Peredo came across a news report that stated that the accident wasn’t the result of drugs or alcohol, but an epileptic seizure. For the first time, Peredo realized that Hutchins had suffered, too, and was likely still suffering. So when he finally came face to face with Hutchins in the early part of 2017, Peredo did something that still stuns Hutchins. Instead, Peredo told him he just wanted to meet him, to talk with him. And through conversations with Hutchins and his father, Peredo learned that, since the accident, Hutchins was unable to work, had become divorced and was still struggling with the effects of epilepsy. A short time later, Peredo stunned Hutchins again. 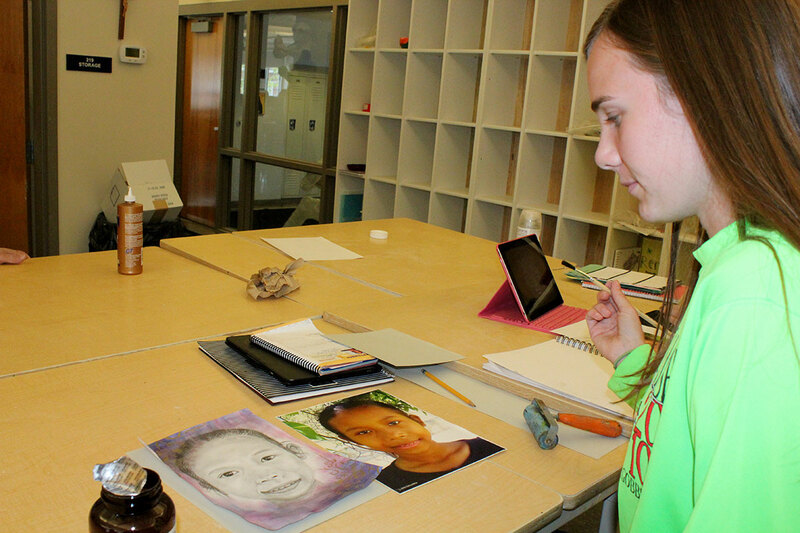 He shared his plan to help them both heal their brokenness. Peredo asked Hutchins if he wanted to walk the Camino with him. “The thought in my mind is that I’m in limbo about the next steps in life,” Peredo recalls. “I’m trying to find my purpose, where I fit in. I knew I was still broken. I wasn’t whole. I was hoping I could create a way to make something great out of something bad—and he would be a partner with me in this. When Peredo mentioned his plan, Hutchins had never heard of the Camino, where it was, or what it entailed. But the more that Peredo talked, the more Hutchins became swept up in the thought of traveling to a foreign country, of being on an airplane for the first time in his life. Concerns of how the epilepsy might impact him while walking the Camino faded amid the plans of the adventure. In the months that followed, Peredo did fundraising for the trip. During that time, he also read “a couple of articles about a couple of people who walked the Camino who had epilepsy,” trying to learn more about how the journey might affect Hutchins. Wanting to help protect Hutchins if he fell on the trail, Peredo bought knee pads, elbow pads and a helmet for Hutchins, insisting he wear them when they began walking. 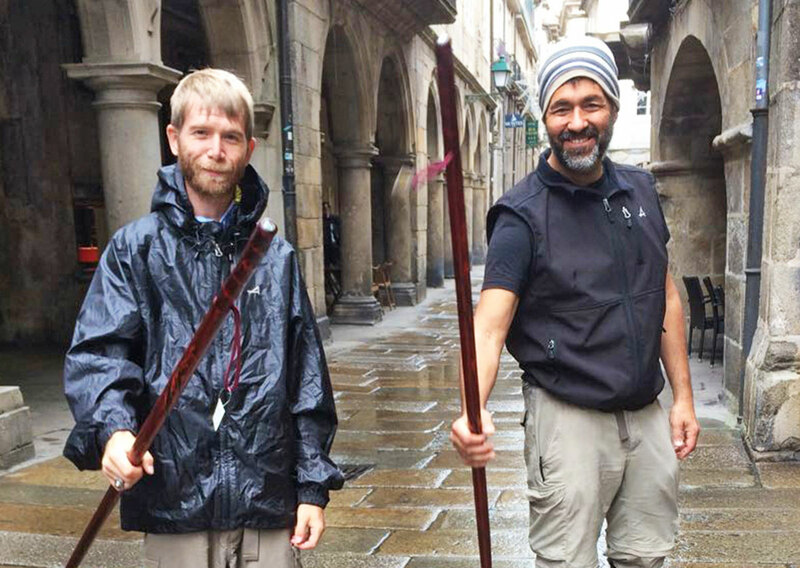 Finally, in late October of 2017, they set out from a small town in France on the ancient pilgrimage path that leads to the shrine of St. James at Santiago de Compostela in northwestern Spain. And on the first day, as the 49-year-old Peredo and the 33-year-old Hutchins walked up a mountain, their journey almost ended in disaster. Peredo was also carrying some emotional baggage from the journey he had made on the Camino a year earlier. In many ways, that 2016 pilgrimage was his attempt to “reset my life” after the accident on April 10, 2015. That day, the married father of three had been driving home to Lanesville on I-65 South after a meeting in Indianapolis that had secured a deal with a national company for his growing marketing-design business. Shielded by the traffic ahead, he never saw the car, heading northbound, cross the median out of control until it was too late. “A car was coming at me at 50 to 70 miles an hour,” Peredo recalls. Firefighters used a “jaws of life” device to extract the bloodied Peredo from his smoking, crumpled car. He recalls being put on a stretcher, lifted into an ambulance and rushed to a hospital where the ordeal of six surgeries on a shattered right foot and two surgeries on the shattered right bridge of his face began. At the same time, Hutchins was rushed by helicopter to a hospital. The accident left his body broken, with fractures of an ankle, a leg, fingers, ribs, a kneecap and a collarbone. His face had to be reconstructed, with a permanent metal plate holding his chin together. “The police officers were surprised that both of us were even alive,” Peredo says. Yet as horrific as the accident was—an accident that also eventually led him to lose his business—what devastated Peredo even more was the death of his father from cancer on July 28, 2015. During that first pilgrimage, Peredo often thought of his father as he walked, leading to an emotional moment. Peredo also remembered the advice that his father sometimes gave him—to “keep going forward” in life. He followed that advice again as he carried his backpack and Hutchins’ backpack on the first day of their Camino journey. That approach of moving forward also began to work well for Hutchins after that first day. He stopped smoking within the first few days of the journey, and he began eating lighter meals, relying on more soups and energy drinks that helped with staying hydrated. He and Peredo also stopped by a medical clinic on the Camino where they sought the advice of a doctor about the medicines he was taking for his epilepsy. With all the changes, he felt better, more confident, and on one of the mountains they climbed, he found himself passing other pilgrims. He even stopped to help one of his fellow pilgrims make it up the mountain. “She gave me a cross from Israel,” he recalls. But there were tough moments, too. He never adjusted to the dormitory-like hostels where they slept with other pilgrims. He struggled when others spoke a language different than English. He missed his two children. And there were times when he feared what would happen if he had a seizure, fell in a ditch and no one found him. The mostly “ups” and occasional “downs” of the journey for Hutchins seemed to mirror the relationship that he and Peredo had during the pilgrimage. Many times, they opened their souls to each other. “We talked about each other’s families, our life experiences,” Hutchins says. At other times, they became frustrated and irritated with each other. On those days, they walked with other pilgrims, keeping their distance from each other. The depth of their bond overflowed when they sometimes talked about faith. Peredo considers his Catholic faith as an important part of his life, with “a special place in my heart for Mary.” Hutchins found his faith growing during the pilgrimage. 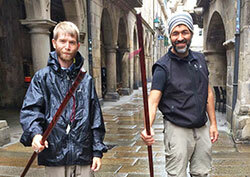 After 40 days and 460 miles of walking, Peredo and Hutchins reached the shrine of St. James at Santiago de Compostela. By the end of the journey, Hutchins had long ago discarded his helmet, and he suffered only one seizure along the way. For Peredo, the second pilgrimage gave him the peace and healing that had eluded him during his first journey along the Camino. He embraced part of that peace and healing with Hutchins in a way he never expected. He pauses, collecting his thoughts about how far he and Hutchins have come from that moment when their worlds collided. “For me, going through this process of healing and letting go and not hating is something I needed to do—to prove to myself, to prove to my children that you have to stay the course, and that something good will come from it.